Wreaths are such a lovely Christmas decoration and even more special when they are handmade. I love to put on some festive music and get into the Christmas mood with my 'craft hat' on and make my own. This year, I thought I would put a Hello Party spin on it and use some balloons to add a bit of party spirit! I thought I would share how I did it with you so you can make your own! A selection of festive foliage and flowers. I got some beautiful eucalyptus, wax flowers, roses and ranunculus from the fresh flower company. I also used a festive bouquet from Waitrose that had some lovely Christmassy pine branches and leaves. Wire craft rings in various sizes. I got mine here. Twine or ribbon for hanging the rings. A selection of mini balloons. In the demonstration, I used The blushing rose mix. In the other wreaths in the final and header photo, I also used the wintergreen mix and the rose gold luxe mix. Micro battery operated fairy lights. I got mine here. To start with, I inflated my balloons. To get the best results, use a hand pump (you can get one here) and do not over inflate so the balloons keep a spherical shape. It also looks nice if you make them different sizes to add more interest to your wreath. Then trim some of your foliage with your secateurs to create a mini posey. 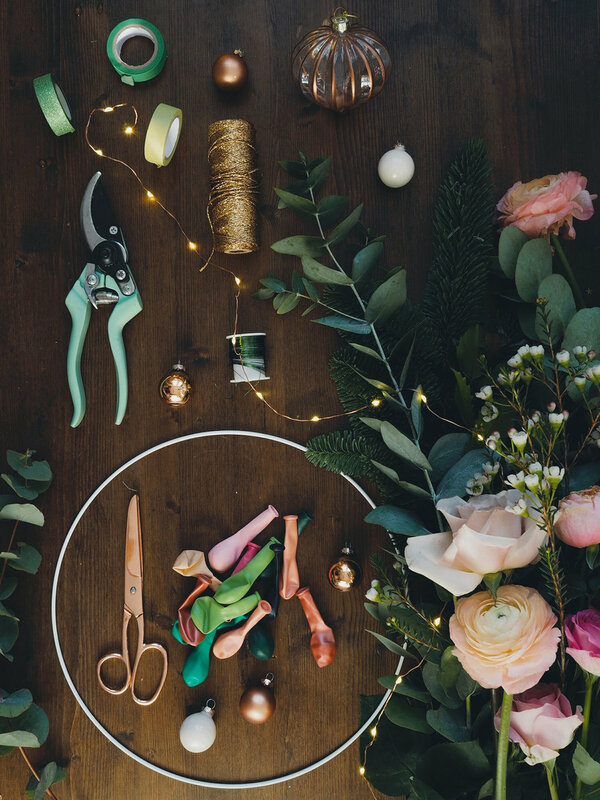 Tie the posey together at the base with some florist wire, leaving a long length free and use that to then wrap around the craft ring to secure the posey to the ring. For this wreath, I decided to do a symmetrical design so I repeated step 3 on the opposite side of the ring. Now it's time for the fun bit, let's add the balloons! Tie the tails of 2 balloons together, then wrap them around the ring to secure and repeat until you have covered the ring. If there were any gaps, I used a low temperature glue gun to stick small balloons in the spaces. You could use glue dots if you don't have a glue gun. Tie some ribbon or twine at the top of the ring so that you can hang it. Finally, I wrapped the battery operated fairy lights wire around one of the rings and hid the battery pack. In the end, I created 3 different sized rings and hung them on the wall using washi tape. For the larger ring, I used a command strip hook as it was a bit heavier. 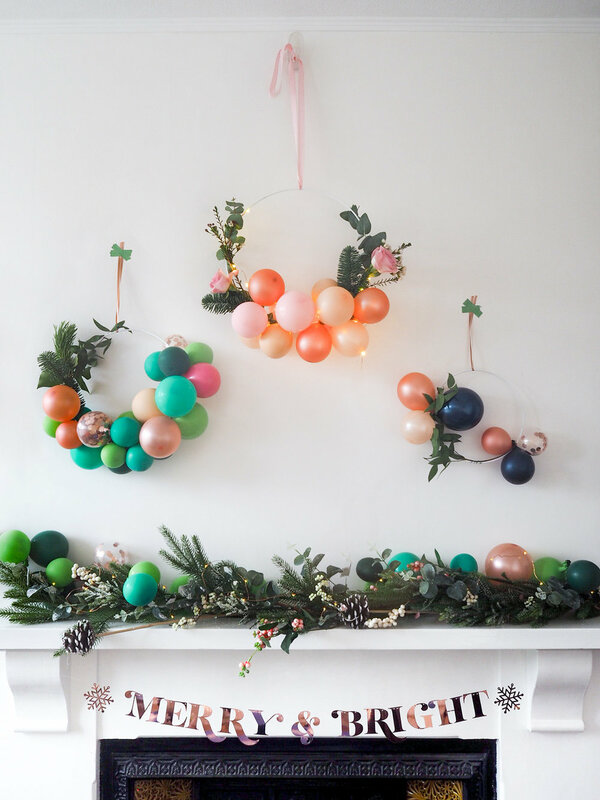 There you have it, a simple but very pretty, festive balloon wreath. 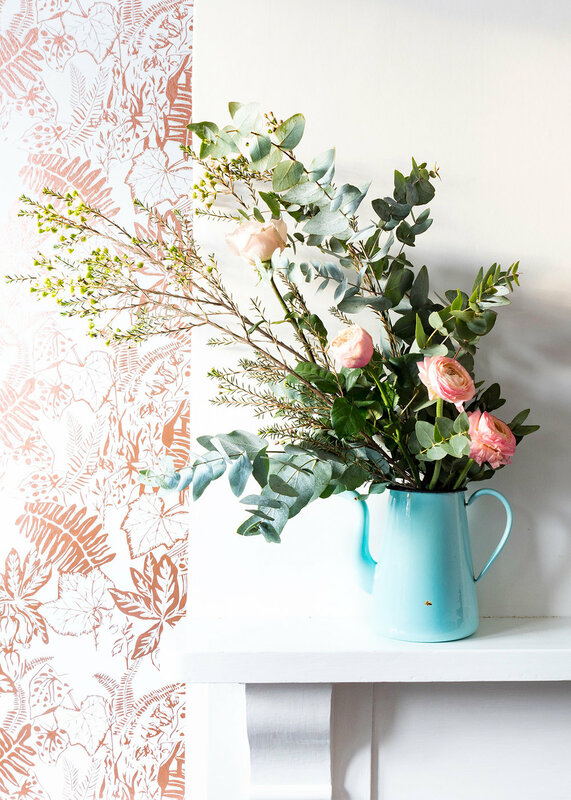 If you are having a party then fresh flowers are a beautiful addition but do keep in mind that they won't last very long as they will wilt without any water. 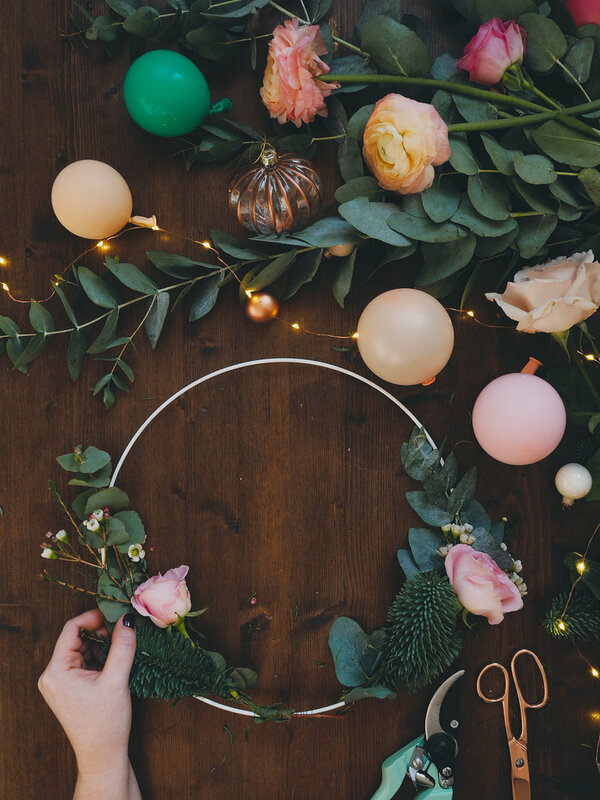 If you are hanging the wreath as a more long-lasting Christmas decoration, I would stick to the evergreen foliage as it will last longer or why not try dry or silk flowers which would last forever! Have fun with the positioning of your foliage and balloons too, the possibilities are endless! Enjoy the rest of the Hello Party advent and if you haven't signed up for updates yet, then you can do so here and you'll get an email when the next treat or offer is available. I would love to see what you create, so don't forget to share!